Little Bunting – The dominant species on the island. Conservative estimate of 200+, mostly feeding in the fields. Chestnut Bunting – Ranking 2nd in terms of numbers amongst the buntings. The log late afternoon on 9th brought in a fresh wave. At one point there were about 2 dozen in a single spot. Yellow-browed Bunting – Feeding frantically with the others. 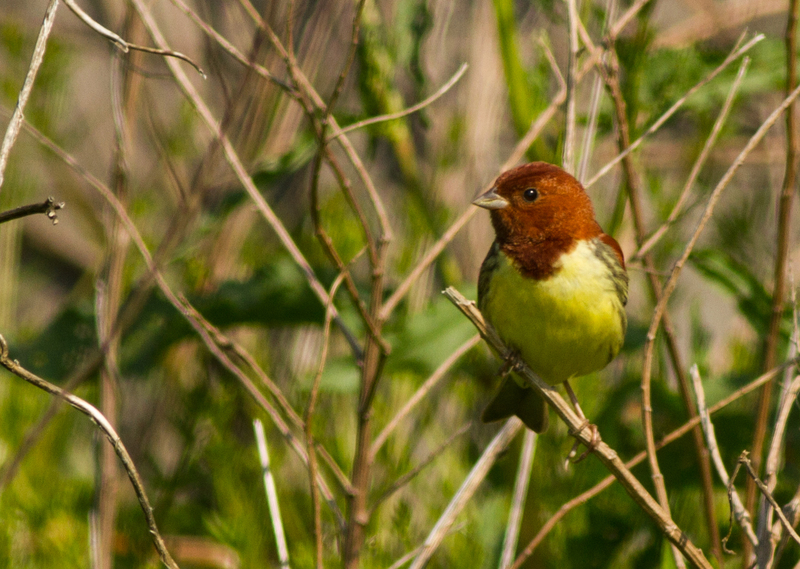 There were times when 5 species of buntings were present in the same field of view. A delightful sight indeed! 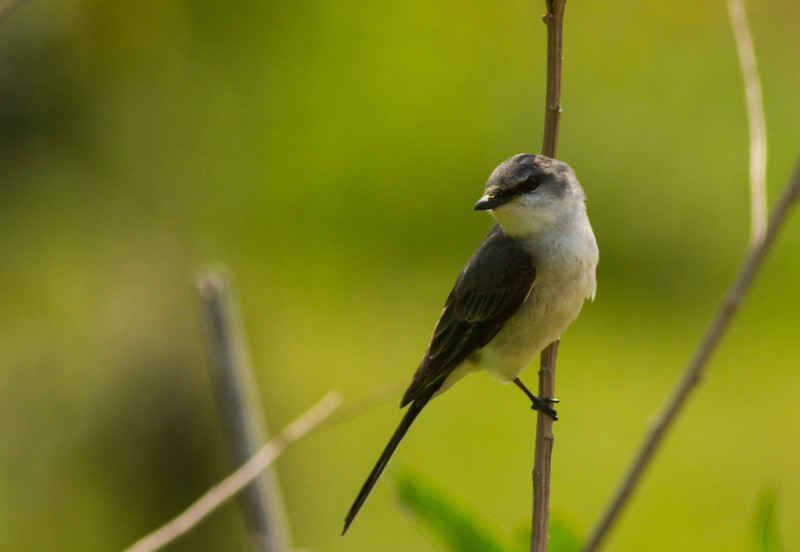 Mugimaki Flycatcher – Close of 3 dozen birds throughout the island. The dominant species of the “colorful” flycatchers. Asian Brown Flycatcher – The dominant flycatcher species. At least 100+. Taiga Flycatcher – A male in breeding plumage calling through the fog after sun down. Good looks from about 15m but too dark to photograph. 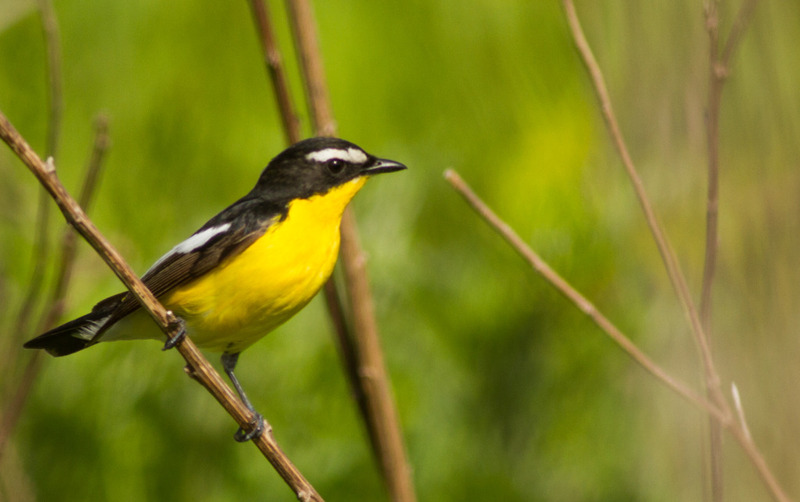 Yellow-rumped Flycatcher – Some rather confiding individuals. Under a bright blue sky, there are few birds that can look prettier! Yellow-browed Warbler – The dominant warbler. Too many to count. At one point, there were 11 birds feeding in the same tree. Eastern-crowned Warbler – About 20 individuals encountered during the stay. Brown Shrike – About 8 birds, mostly concentrated near the village and the ‘col’. 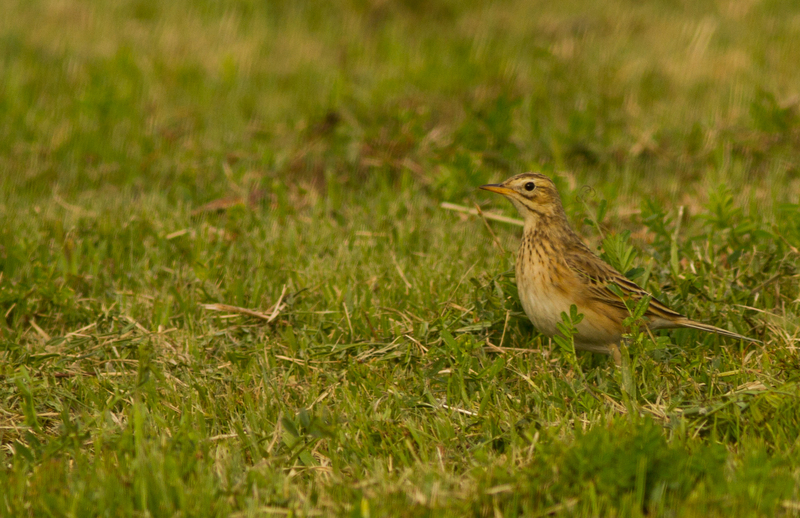 Richard’s Pipit – 5 birds near what used to be the pond. Rather approachable. Siberian Blue Robin – A couple of birds seen at dusk though the fog. Rufous-tailed Robin – Large numbers, mostly heard. Yellow Bunting – 3 birds seen on the morning on the 10th. 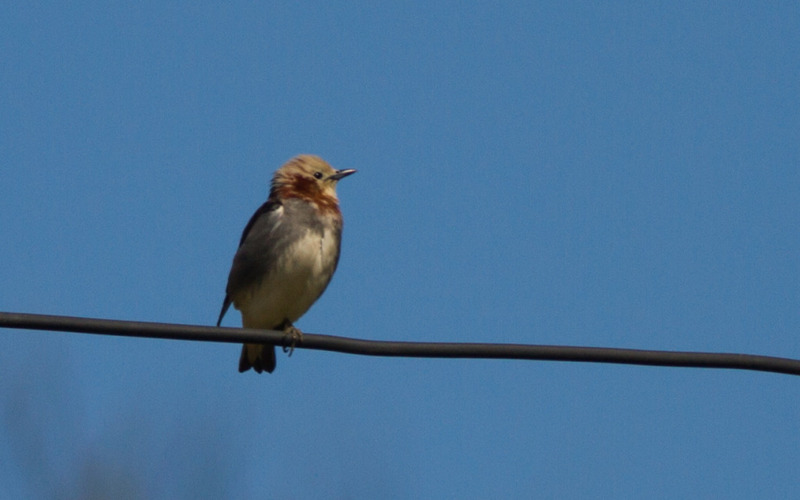 Chestnut-cheeked Starling – Seems freshly arrived on the morning of 10th along with a Red-billed Starling. Daurian Starling – Seen minutes before boarding the return boat. First seen feeding on the top of a tree but soon went into the foliage. White-throated Rock Thrush – 4 birds including 3 males. White-breasted Waterhen – Probably pulled in by the fog. Seen first on 9th at dusk and encountered multiple times in the morning next day. Chinese Grosbeak – Somewhere between 30 and 40 birds. 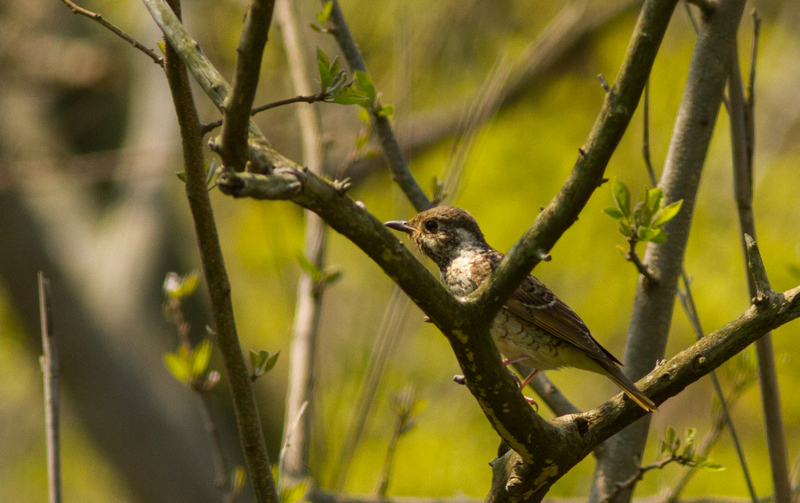 Dusky Thrush – The only species of thrush other than Pale Thrush. probable Common Rosefinch – A female type bird seen perched at a distance. Soon after 3 birds flew out with one strikingly red individual. Based on overall shape, bill structure and color of the male, it was probably this species. Oriental Scops Owl – Heard multiple times after 4pm on the 9th. Calls from at least 4 individuals. Oriental Cuckoo – Heard only. One point worth noting was the complete lack of any wagtails.